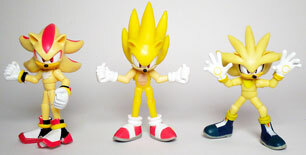 This page covers (vaguely) "Line 4 & 5" of the 3.75 inch line Jazwares Sonic figures. They DID NOT clearly define "Lines" of figures either by separating releases by an amount of time, or making up some kind of a list. 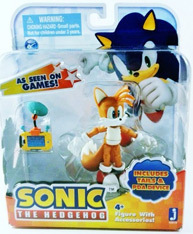 The Toys R Us exclusive expired in late 2010. 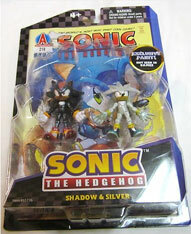 (BigBad Toy Store has them now, at a lower mark-up than all other online retail. If your TRU isn't stocking the figures, this, OR Suncoast Video Stores (in malls) may be the best place to get them, possibly also FYE stores (in malls). 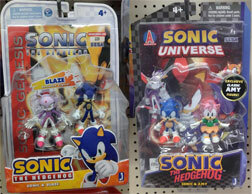 "Big Lots" (clearinghouse style store in USA MAY have some 3.5 line) ForbiddenPlanet UK has added the figures too! They're 5.99 pound. 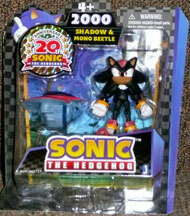 Alton Towers Resort shop has 3in figures for £5, Sonic / Jet Free Riders figures for £10 & 5 inch jazwares sonic for £10. 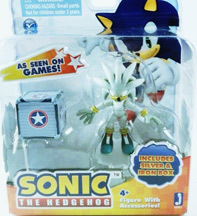 Argos (online) has blindbox 3in for 4.59 pound. Argos online BB figures not reccomended, due to package damage/figure damage. info by Dio Soth, Kingboo & Fuzzball Raccoon. Grab this 2 pack if you want her. 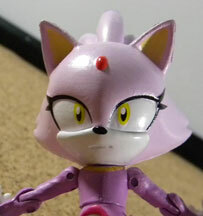 It's annoying that The Girls Curse won't let them single pack her / forces you to buy yet another Sonic just to get her, but if you like Blaze, she's worth it, because she's so well done. The #1 issue is also a big helper here. If you don't collect Archie you can always sell it later. She may be single carded later, or re-released in some other way, but this is a good opportunity. 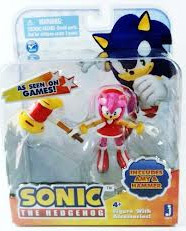 *Beware of broken Blazes in the package. At least 1 has been reported where the arm & tail fell off as soon as the package was opened. 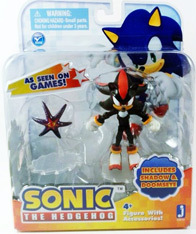 In winter 2012 / early 2013, Jazwares decided to release a line of 3.5 inch figures with accessories. These figures are all the same as the previous ones, but they come with an accessory & sometimes an extra stand for their item. Notice that the figures all also have the same 'spin' shaped stand, though now it has been changed to clear. The box states what's in it, and somewhat non-sensically says "As Seen on GAMES"...well...yes...but the statement seems un-necicarily generic. 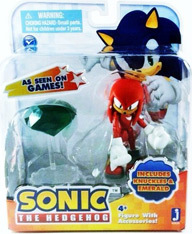 Knuckles comes with a nice-sized green emerald. 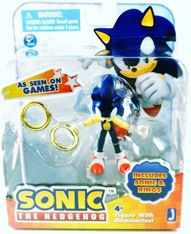 Notice that it is NOT labeled as the "master emerald", which is good, because it's not the right size to be the master. The emerald fits onto a clear post on its stand. be sure to pick up THIS version by inspecting the joints in the store. Photos by TiggerCustoms. Here goes yet another Blaze pack, this time with issue 218 of the comic instead of Universe (where she actually appeared) this appears in 2013 & proves they're having to include just any issue at random. Photo & owned by Dustin Lee Autry. Here are 2 more comic pack mix ups. 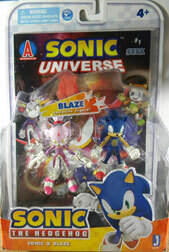 The first has Blaze & Sonic with a "Genesis" issue, which was the 'retro' one from Archie and had nothing to do with Blaze. The other is classic Sonic & Amy, but with an issue of Sonic Universe that has a giant Shadow head on it...creating a great big mis-match of classic & modern.